It´s the original engine. Numbers and everything looked right when I ordered the MAF ??? Those are some nice propane tanks! Shuld provide you with all the domes you need 20kg? Ours are usualy 10kg. Pitty on the maf. Hope you get the right one soon! Right, the most common ones are P11 (propane 11kg). I can get them for free and I use it for the housing. These are P19. Quite rare. Thats’s why I bought them. Slightly larger diameter. The P11 fits in the P19 creating a small void, which I use as my surrounding preheat (and insulation) void. Aha so you will copy paste your rabbit gasifier? Will you keep rhe auguers? Well, kind of. I’m batteling with the idea wether I should make an out/inlet for the auger or not. I think I may make one just in case I get constipated, since I will try your grateless design. A couple of days off and of course it’s pouring down. 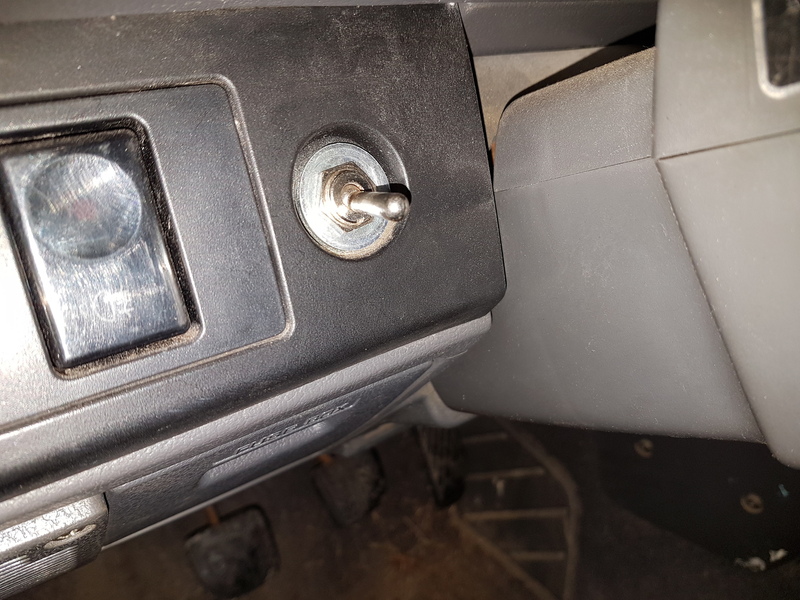 I decided I had to start somewhere, so I managed to install a fuelpump switch. JO, are you sure you were not huffing a little woodgas yourself? It seems a little dangerous when you hear truck voices whispering suggestions to you and then you comply. Ha ha ha, that’s a good one Don. Haha! I can feel woodgas feaver 2000km from you amazeing sound. Such a nice idle and throtle responce. Ha, l started my Mercedes build the way you did too. From the engine backwards. From the engine’s real-needs FORWARDS is the way all serious use-power woodgasing ever gets done. 1920’s/30’s to 21st century, today. In a 2-throat gasifier the process volume and 2 vertical flows are always based on a cold & empty “environment” as defined by the motor’s maximum net gas consumption. Not whole the consumption flow, but a percentage depending on general size and fuel size. Nozzle-tip flows are based on air at the water freezing point multiplied by so and so many multiples of a “Kelvin step” (273,15*C) according to expected preheat values. Always starting at the absolute 0-point! Blow velocities determined accordingly. ~ 60% of the produced cold gas flow. In one throat gasifiers the only (single) vertical flow is usually set ~1,7 m/s. My Rabbit reduction is ash insulated. Mazda’s reduction will be somewhat more exposed to the gasifier housing and the air preheat mantel. This is why I decided to put some extra effort into the cyclone/heatex pre-preheat. Pic1: Finned cyclone. A few more cutoffs will be welded on for heat transfer. 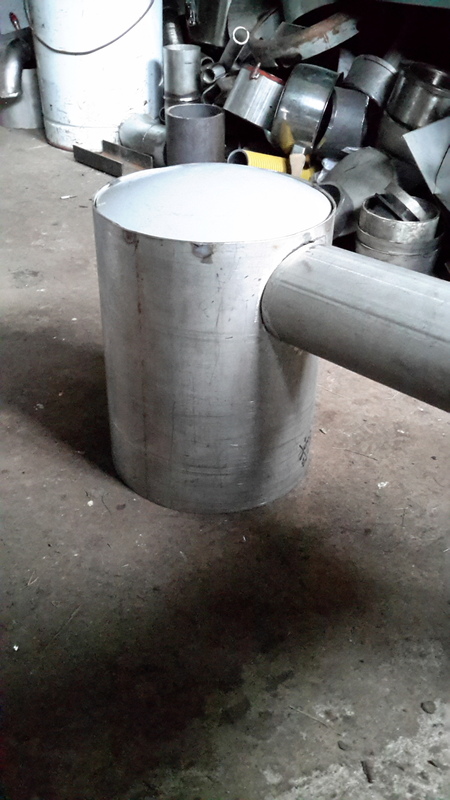 3" flatened inlet with compression fitting cone. 2.5" outlet. Pic2: Preheat air inlet/wg outlet. Finned pipe-in-pipe. Pic3: Surrounding air mantel which will eventually be insulated. Very nice work JO, all stainless steel? You did, l thod you got a new one. Thank you. 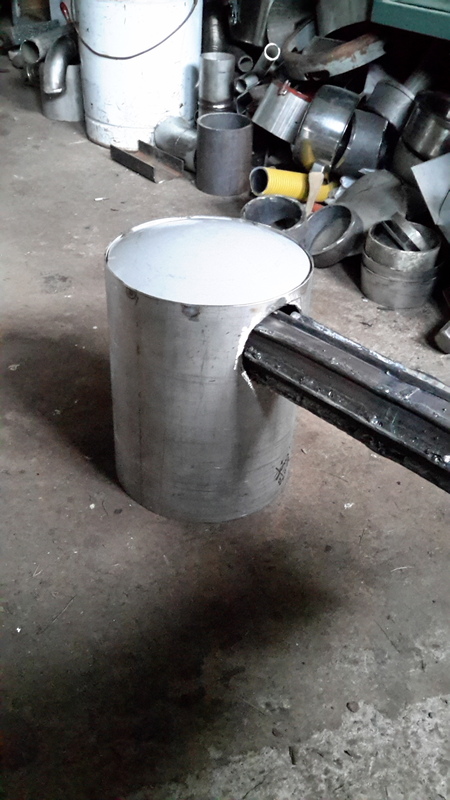 Well, most is stainless, but some parts will be ordinary mild steel. 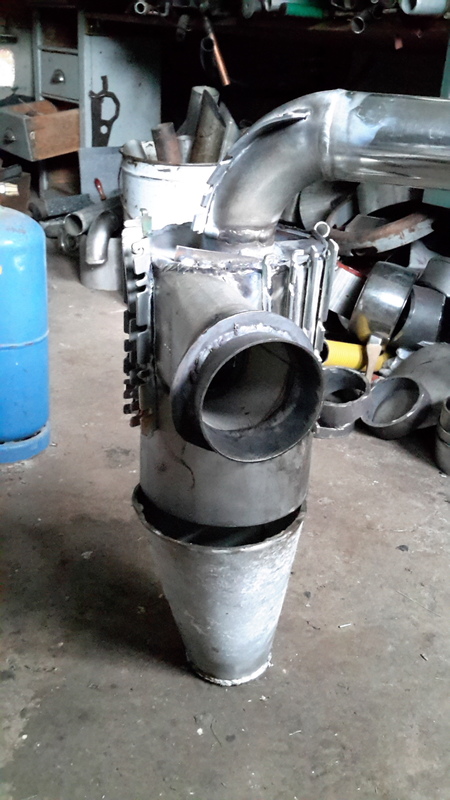 The gasifier housing for example, will be outof an ordinary propane tank. Went for a 100 km extra DOW after work today - BINGO! Got two empty 11kg propane bottles for free. The guy att the place asked me what I was going to do with them. Ended up at the parking answering questions about and showing the Rabbit system. He made me promise to show up again when the Mazda is up and running.